Pupils simply drag the correct continent or ocean to the correct place. There are mark, feedback and reset buttons at the bottom for your use with the activity. Pupils simply drag the country labels to where they think that they should be positioned and drop them (either on interactive whiteboard or using teachers computer). 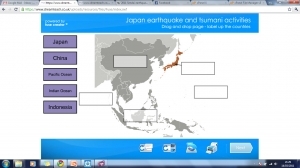 This exercise gives pupils familiarity with the European countries. Pupils simply drag a line from each flag to the correct country. Clicking the feedback button at the bottom will show pupils how many they have got correct, whilst there is also an otpion to reset at the bottom. 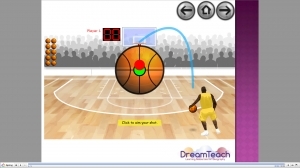 THis HoopShoot game tests pupils general knowledge in Geography. It can be played as a one or two player/ team game and pupils get to shoot at the basket if they get their question correct. 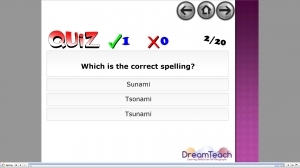 This is a multiple choice quiz in which pupils have to decide the correct spelling of the Geographical terms. This could be set in teams or an individual pupil attempting the quiz on their own. There are 20 spellings randomly selected..
Pupils simply guess the which country each flag belongs to!! These are interactive activities for pupils to use. There are three pages in total although the next button will not work until the activity has been attempted. The mark and feedback buttons both give pupils an idea of how they have performed. This resource focusses on the recent Mexico landslides. There are 4 pages in total, some with information and some containing activities. The mark and back buttons at the bottom help to improve the activity further. In this resource, pupils need to drag the correct labels to the correct places in the UK. The mark and reset buttons at the bottom are available to aid the activity. The idea for this resource came from Lisa Rabbetts, who won the DreamTeach suggest a.. This penalty shootout will test pupils knowledge of Wales. These games are very popular with pupils. Pupils answer questions in order to take penalties! As there is the option of one or two players, they can be used with individual pupils or groups..